In this article, we will show you how to create a Spring MVC application to create, read, update, and delete (CRUD) the student records into the database. Spring JDBC module gives the functionality to create the database connection via DriverManagerDataSource class and to query with the database it provides the JdbcTemplate class. Capture the student records and store it into the database. Fetch the student records from the database and display it on the JSP. Update the existing student records into the database. Delete the student records from the database. Find the list of technologies used in this application. Find the table structure used in this application. Create a Student model class, declare student specific variable and generates its getter and setters. Create the StudentDao interface. It will contain the method signature that we implement later. Create another class StudentDaoImpl that implements the StudentDao interface and implementation of all the methods. As we defined the methods in StudentDao interface, every method has a different responsibility. 1- create() will accept the Student type data i.e our model class and return >0 integer value if records saved in the database else return 0. 2- read() method will return the List of all students that stored into the database. 3- findStudentById() will accept the student id and return student details based on the id. 4- update() method will update the existing student records into the database returned by findStudentById() method. 5- delete() will delete student records from the database based on the student id. And the Spring MVC configuration class will be given below. CreateController class will capture student data from the JSP page and call the respective method to store the data into the database. ReadController class will fetch the student from the database and display it on the JSP page. You can take reference from my another article for fetching data from the database. 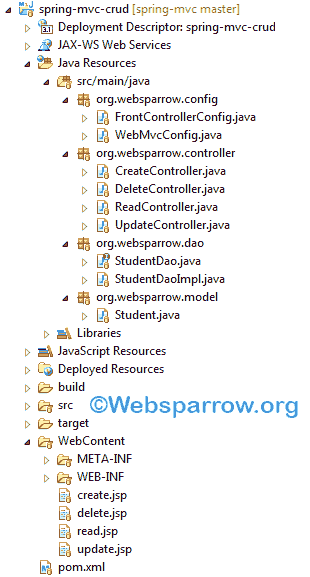 UpdateController class will fetch the specific student records from the database and display it on the JSP page to be updated by calling respective DAO method. DeleteController class will delete the specific student from the database. View pages that interact with the user. 3- Update – http://localhost:8090/spring-mvc-crud/update/6 where 6 is the student id. 4- Delete – http://localhost:8090/spring-mvc-crud/delete/6 where 6 is the student id.